Annan Athletic midfielder Mattew Flynn has been awarded the Ladbrokes award for League 2 Player of the Month for October. After a stop start season last year Matty has now cemented his place in the mangers line up and has played every game of the season so far, scoring 4 goals in the process. 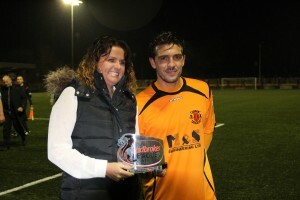 Matty was presented with the award by Ladbrokes Area Manager Rachel Wood after Saturdays match at Galabank.